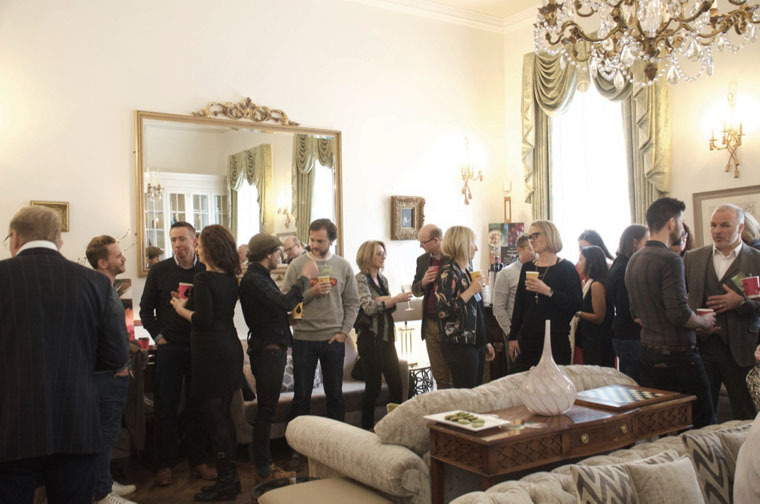 The second event for Taste Mode 2016 took place in London in November. Taste Mode, the latest insight report from Pearlfisher Futures, explores the key cultural, category and consumer shifts defining the food and drink agenda for the next decade, as well as the brands, both challenger and iconic, that are transforming the insights at the heart of this change into a reality. On 10th November, the second in our global series of launch events – ‘How to Create the Food and Drink Brands of the Future – took place at the The Clock, an exclusive member’s training club in central London that imagines a new era of fitness, nutrition and holistic health. Taste Mode London unfolded in the gorgeous drawing and music rooms of The Clock Gym in Marylebone. 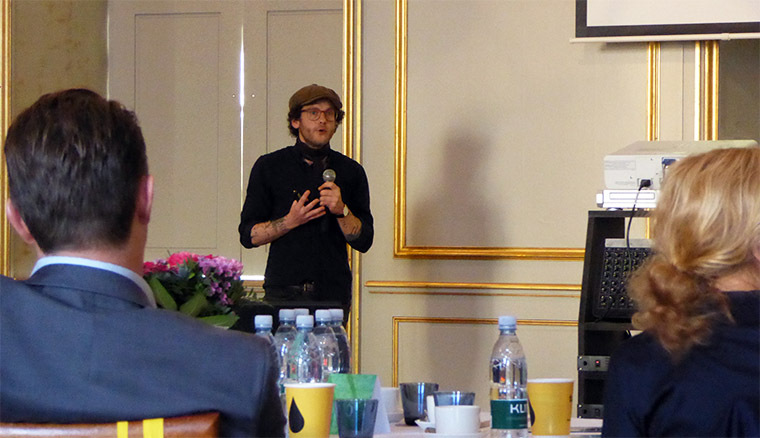 Following an opening address by Pearlfisher’s Founding Creative Partner and CEO, Jonathan Ford, the morning’s event unfolded in four sections, mirroring the four major areas of change identified in the Taste Mode report. The insight at the heart of each shift was introduced by Futures Director Sophie Maxwell and illustrated through a conceptual innovation developed by each of Pearlfisher’s four studios, presented by 3D Design Director Mike Beauchamp. Finally, a stellar lineup of speakers brought the strategic implications of the insights to life with their stories of branding, bravery and innovation. Ben Branson, founder of the world’s first non-alcoholic spirit, illustrated this shift with his story of Seedlip. Born out of a deep love for nature and the family farm Ben grew up on, Seedlip is pioneering a whole new category, encouraging a reappraisal of perceptions of alcohol and reframing the behaviour of a health-aware generation attracted by authenticity. The second shift – an overview of the emerging direction for health – explored how consumer concerns around food’s processing and complexity is giving rise to a more global awareness of nourishment, a new appreciation for ‘naturalness’ and an increasingly connected relationship between food, mood and wellness. 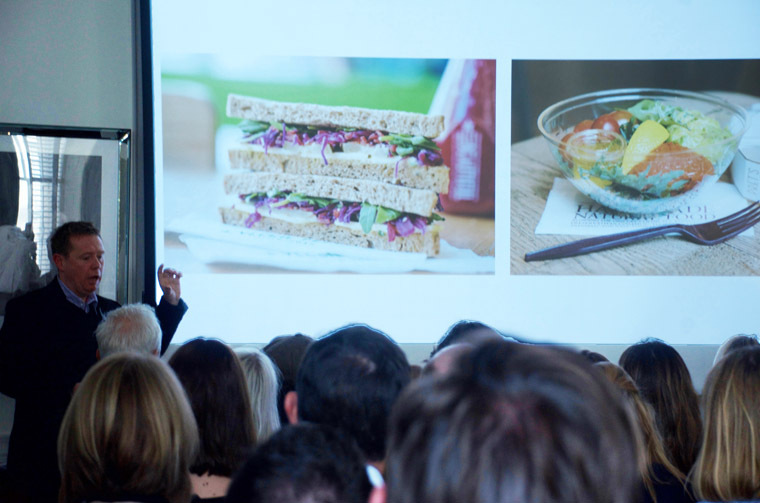 Mark Palmer, ex-Marketing Director for Pret A Manger and the marketing mind behind both Green & Black’s and Cawston Press, brought the new world of health to life with the story of the healthiest ‘pop up’ of the year: Veggie Pret. “The emergence of the ‘flexitarian’ was a definite driver of Veggie Pret’s success,” said Mark Palmer. 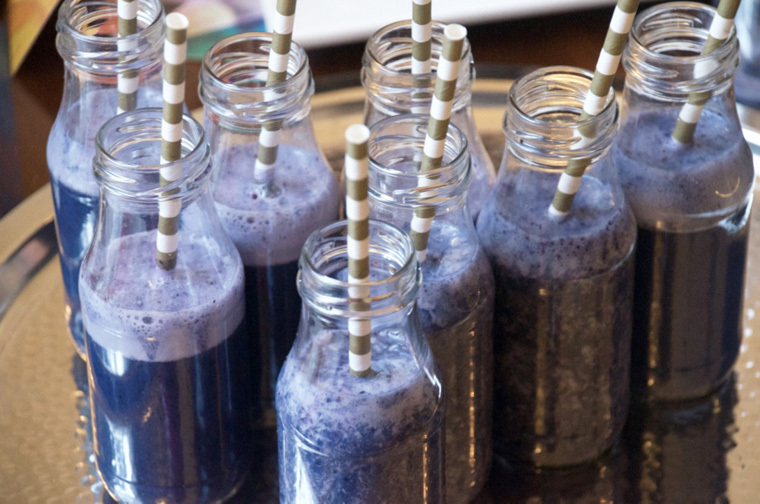 A coffee break saw the attendees settle their breakfasts – a delicious spread of marmalade polenta cupcakes, smoked cheese Pao de Queijo and coconut-cacao granola bars – with protein smoothies, hand-roasted coffee and shots of immune-boosting spirulina. Protein smoothies and coffee-free caffeine shots with guarana and papaya provided a mid-morning energy boost. Drawing inspiration from the changing nature of eating occasions, the escalation of snacking culture and the increasing importance of food and drink choices to our every day routines, Shift 3 explored a future meaning for ‘convenience,’ and the ways in which brands are creating a culture of ‘faster’ food. 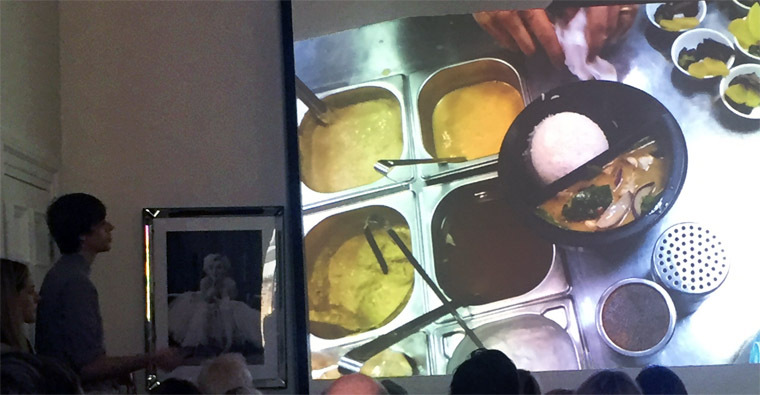 To illustrate the shift, Strategic Business Director at Pearlfisher, Jack Hart, presented Pearlfisher’s redesign of wagamama’s takeaway experience. By translating the cheeky, playful brand values into the home with bespoke packaging structures, the new takeaway experience not only satisfies the consumer desire for convenient yet ‘Instagram-worthy’ food, but elevates the bar for the takeaway category altogether. “We distilled the entire menu into two bespoke packaging structures which are stackable for delivery, improve heat retention and allow for practical and convenient storage in the restaurants,” said Jack of the wagamama takeaway packaging redesign. 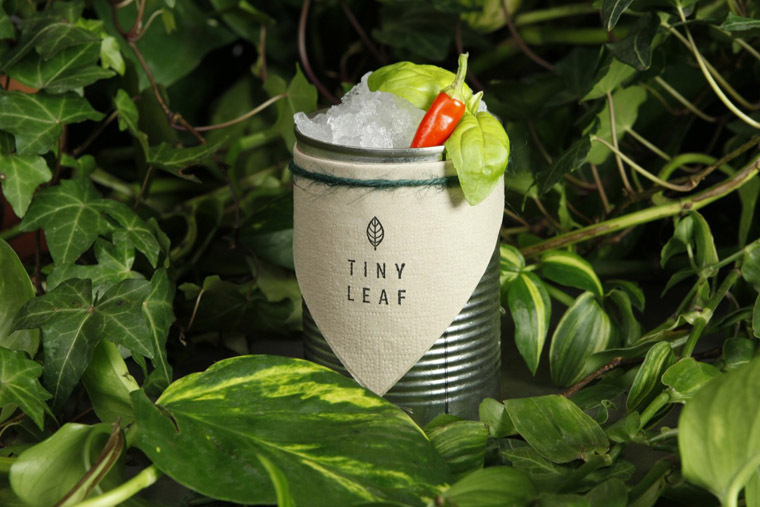 A brand doing just this is Tiny Leaf, London’s first restaurant to make its meals from waste food. 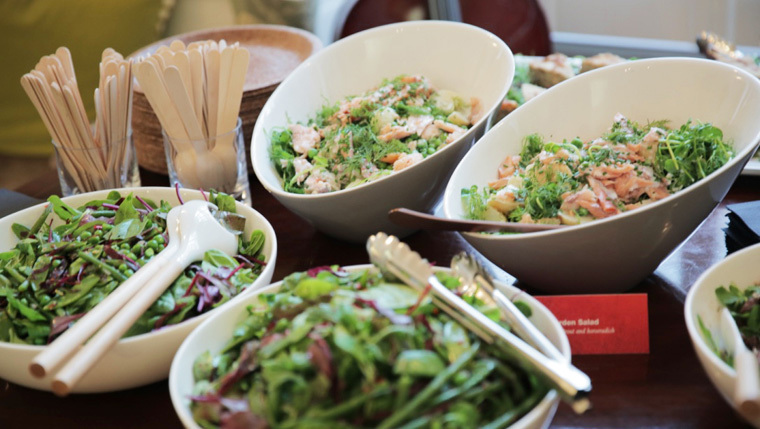 In a Q&A session with Sophie, Tiny Leaf’s co-founder and Marketing Director, Alice Gilsenan, brought the restaurant’s mission of reframing our understanding of food to life, whilst getting everyone’s tummies grumbling just in time for lunch. “Corporations deliberately create products to have short life spans,” says Alice Gilsenan of London’s first zero-waste restaurant, Tiny Leaf. The morning wrapped up with a delicious lunch of buffet salads, matcha lollies and Smart Button chocolate chip cookies. For the braver amongst the audience, there was also a live tasting of crickets and insects by JIMINI’S, healthy protein bars made from cricket flour. 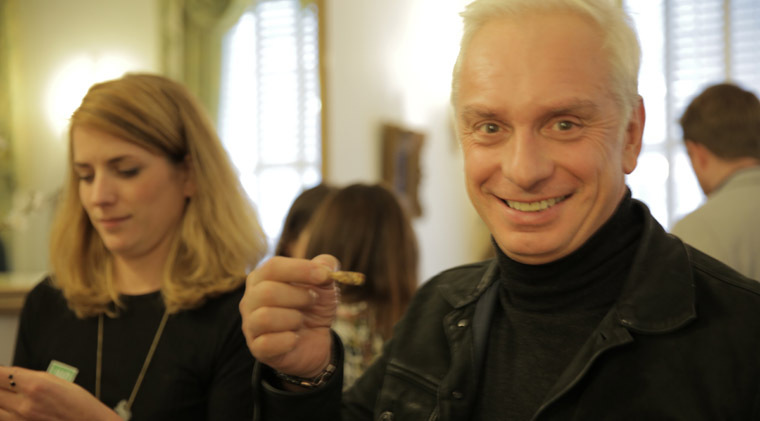 Jonathan Ford, Pearlfisher’s Founding Creative Partner gives a crunchy, dried cricket a go. 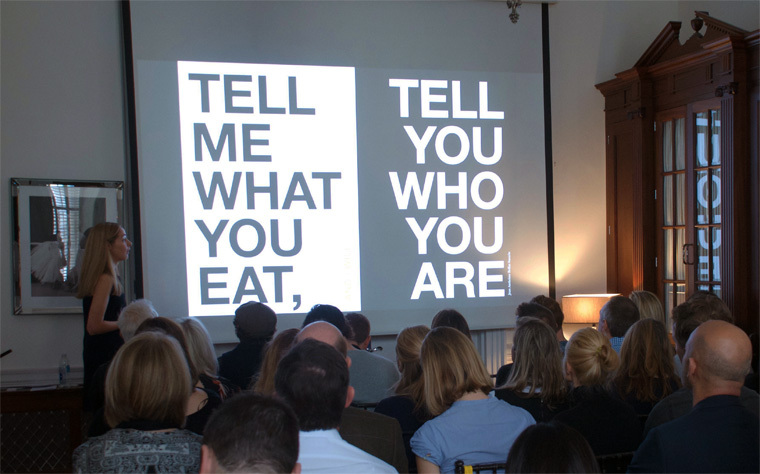 If you couldn’t attend Taste Mode London but are interested in either purchasing a copy of the full report or having us bring the insights to you, please get in touch with presentations@pearlfisher.com.